This season, we are celebrating all new mums with these innovative gift suggestions from the new BabyBjörn Baby Carrier One, to the sumptuous new Diono Quantum Classic, the clever yoomi self-warming bottle and even pregnant mums-to-be can buy something for their bump, this Spring, a Strepelle test. This time of year, it is all about loving mum and appreciating her for all that she is! 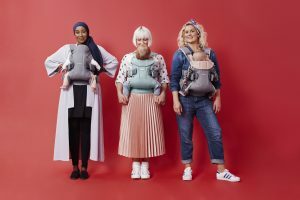 The new carriers are designed with the help of 100 real families, along with paediatricians, babywearing practitioners and medical experts, every feature of the new carriers have been analysed and created for hours of happy babywearing and support for your growing baby’s neck, hips and spine. Suitable from birth all the way to three years old; carry your baby on your front close to your heart, inward or outward facing, and when they are one year old you can carry them on your back, turning the carrier with one simple movement. The new carrier is available in a variety of new colours such as Grey/Powder Pink, Black, Grey, Classic Denim/midnight blue, Anthracite, Silver and Frost Green and more to suit everyone. Spoil a wonderful mum you know with the super clever Yoomi Self-Warming Bottle. Whether you choose to breastfeed, formula feed or combination feed, Yoomi is there for all mums! The innovative self-warming bottle is designed to help mums on their journey at the beginning of life with their new baby. With revolutionary self-warming technology designed to safeguard and protect the essential nutrients in the milk, a yoomi bottle is ready to go from fridge temperature to perfect breastmilk temperature, in one minute. Allowing more time for essential cuddles. Pregnant ladies can show their bump some love this Mother’s Day with Strepelle, the home-to-lab Group B Strep (GBS) test, for peace of mind that when they have the baby they will be protected from Group B Strep. Strepelle was created in partnership with midwives to make laboratory testing for GBS more available and convenient and ultimately save babies lives. The accurate and easy to use test is for use from 35 weeks pregnant uses advanced ECM testing which offers up to 95% accuracy on whether you will have GBS when you give birth. The UK is one of the only developed countries in the world which does not routinely test for this infection, which kills one baby a week here. The home-to-laboratory test can be purchased on-line or in store for £39.99 and contains everything that is needed to provide a sample to the laboratory; instructions, two swabs and a pre-paid envelope; the results will arrive within 3 days of receipt of the sample, either by letter, text, or email (whichever is best for the receiver). If a you are a carrier, all you need to do is let her doctor or midwife know, and antibiotics will be administered intravenously during labour. For Press Enquiries Please Contact Nikki Fox or Adeola Wilson for further details and images.